Mickey Robinson left his earthly home for his eternal home in heaven at 11:13, Monday, January 14, 2019 where the grass is always green and the wheat waves gently in the wind. Mickey, son of Arthur (Art) and Ila Mae Russell Robinson was born August 23, 1939 at the Ponca City Hospital. He grew up spending a majority of the time with his grandparents, Sam and Elsie Robinson Loving in Old Bliss. Mickey was a 1958 graduate of Marland Public School. Always a hard worker, he worked for Bliss Co-op in Marland; Hastings Motor in Ponca City; GE at Strother Field at Winfield, Kansas; Valentine Ranch in Glen Rock, Wyoming and was owner/operator of Ponca City Small Engines in Ponca City. August 30, 1981 he and his high school sweetheart, Catherine Evans, were united in marriage at the United Methodist Christian Church in Marland. They began their life together at home in Marland prior to building on the Evans homestead in Old Bliss. Shortly after their marriage, Mickey closed his business to begin his dream of being a farmer. He not only farmed Bliss Acres (Evans family farm), but he and Catherine had a custom harvesting business. They also had a marketing pig operation. In the cold of winter, Mickey was always reading gardening catalogs to research the latest garden trends, seedlings, plants, anything to enhance his next year's garden. His greenhouse was always filled with seedlings and flowers. Their huge garden produce was shared with many family and friends. 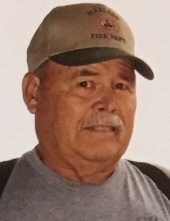 Though a man of few words, he has served on the Bliss Co-op board, Noble County Flood Plains, and Noble County Fire Safety Association. Mickey was a member of the Noble County Rural Water District #4 from 1985 until 2018, operator/secretary from 1999 until 2018. Mickey served as a fire fighter for the Marland Volunteer Fire Department for twenty five years. He served as Fire Chief for 17 years before stepping down in 2015 passing his knowledge on to the next generation. Mickey was very proud of the department and was determined to make it the best. He was successful! In 2006, Mickey was told he needed a heart transplant but was too healthy at that time to be put on the transplant list. At age 70, he was then told he was too old for a transplant but could qualify for a Left Ventricular Assist Device (heart pump) through a research program. Mickey's heart pump was the last installed before being approved by FDA. The family would like to give a special thanks to the LVAD team at Integris Baptist Hospital in Oklahoma City. Mickey was preceded in death by his parents, grandparents, sisters, Rotha Mae Robinson McAlister and Barbara Hargis and brother Larry Robinson; best bud, David Benham. He is survived by his wife Catherine; son and daughter-in-law Mike and Shannon Robinson; daughter and son-in-law, Monica (Robinson) and Jerry Lanning; daughter Angela and Richard Jahnel; grandsons Brandon and Cameron Grimm, Josh Robinson and Nathan Jahnel; and several great grandchildren. Mickey is also survived by brother, Dennis and Kerri Hughes; Sisters, Pam and Rick Hutchinson and Sharon and Paul Spears and brother-in-law Ronnie Hargis, numerous nieces, nephews and cousins. Viewing will be Thursday, January 17, 2018 with family greeting friends from 6 p.m. to 8 p.m. Services for Mickey will be Friday, January 18, 2019 at 10:00 a.m. at the United Methodist Christian Church in Marland with Reverend Chris Short, pastor, officiating. Burial will be at Resthaven Memorial Cemetery in Ponca City. Lunch will follow at the Community Center in Marland. Pall bearers will be Walter Evans, Carl Evans, Kevan Pulliam, Eric Carlile, Danny Peeper, Gene Grimm and Seth McCool. Honorary Pall bearers will be Richard Cockrell, John Turnipseed and members of the Noble County volunteer fire departments. Memorials can be made in Mickey's honor to the Marland Bucket Brigade for the Marland Fire Department, 18400 Badlands, Marland OK 74644. To send flowers or a remembrance gift to the family of Mickey Robinson, please visit our Tribute Store. "Email Address" would like to share the life celebration of Mickey Robinson. Click on the "link" to go to share a favorite memory or leave a condolence message for the family.